Largest county by population and area: Los Angeles, 9,935,475 (2005); San Bernardino, 20,164 sq mi. 2000 resident census population (rank): 33,871,648 (1). Male: 16,874,892 (49.8%); Female: 16,996,756 (50.2%). White: 20,170,059 (59.5%); Black: 2,263,882 (6.7%); American Indian: 333,346 (1.0%); Asian: 3,697,513 (10.9%); Other race: 5,682,241 (16.8%); Two or more races: 1,607,646 (4.7%); Hispanic/Latino: 10,966,556 (32.4%). 2000 percent population 18 and over: 72.7; 65 and over: 10.6; median age: 33.3. Although California was sighted by Spanish navigator Juan Rodríguez Cabrillo in 1542, its first Spanish mission (at San Diego) was not established until 1769. 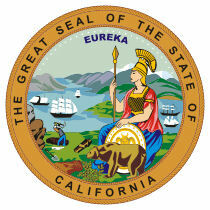 California became a U.S. territory in 1847 when Mexico surrendered it to John C. Frémont. On Jan. 24, 1848, James W. Marshall discovered gold at Sutter's Mill, starting the California Gold Rush and bringing settlers to the state in large numbers. By 1964, California had surpassed New York to become the most populous state. One reason for this may be that more immigrants settle in California than any other state—more than one-third of the nation's total in 1994. Asians and Pacific Islanders led the influx.